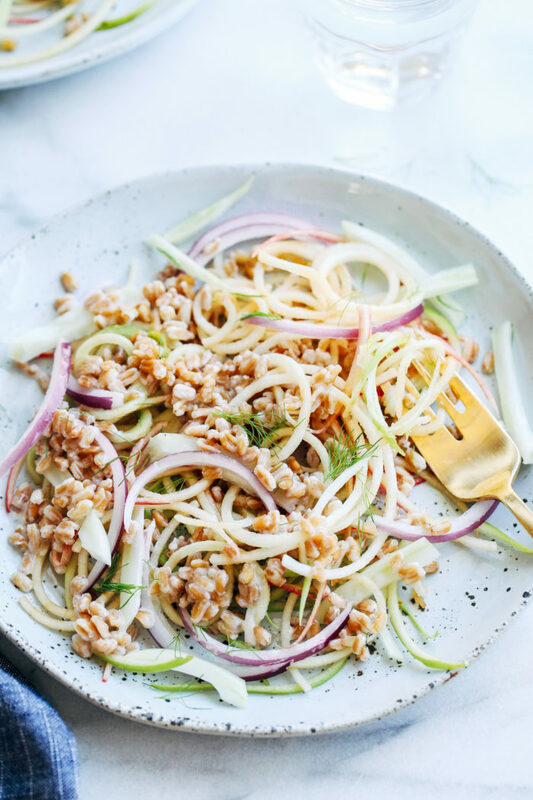 Autumn Apple and Fennel Salad with Farro- crisp apples with fresh fennel and pearled farro in a creamy lemon dressing. 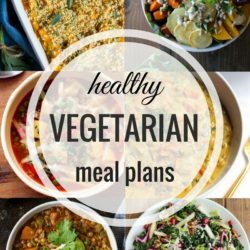 Perfect for healthy lunches or as a holiday side! 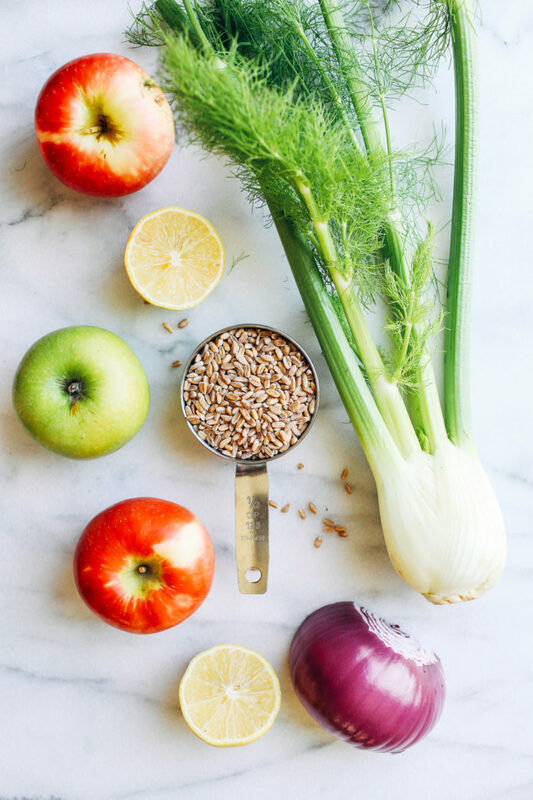 Can we talk about the magic that is apples and fennel? Holy yum, what an awesome combo they make. Fresh fennel used to be a foreign concept to me but ever since I tried it in this Winter Kale Salad, I haven’t been able to get enough. The light licorice flavor and and crunchy texture is surprisingly addicting. I find myself craving it this time of year, especially in salads paired with sweet crisp apples. 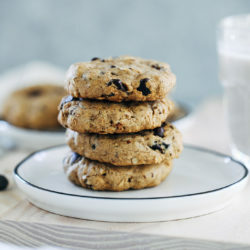 I came across this recipe from Cooking Light recently and it instantly caught my eye. Seeing the apples spiralized into tendrils with fennel and red onion in a creamy dressing made me want stab a fork at the screen and take a bite. My version is only slightly different, using farro in place of wheat berries and omitting the added sugar. I find fresh Honeycrisps to be plenty sweet on their own so it’s not really necessary, in my opinion. If you’re new to farro, it’s an ancient grain that dates back to the Roman Empire. In fact, it was considered so precious to the Romans that they sometimes used it as a form of currency. Today it remains a staple in the Mediterranean diet thanks to it’s delightful chewy texture and nutritional value. 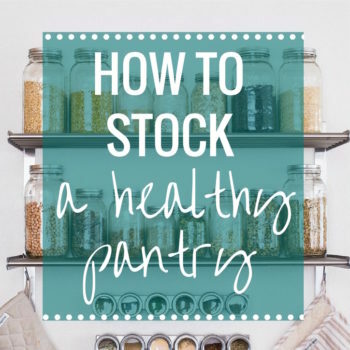 It’s high in protein, fiber and iron, and is also naturally lower in gluten than modern wheat, making it more tolerable to those with gluten sensitivities. I’m sure you’ve probably gathered this by now but I try to support organic farming practices whenever possible. 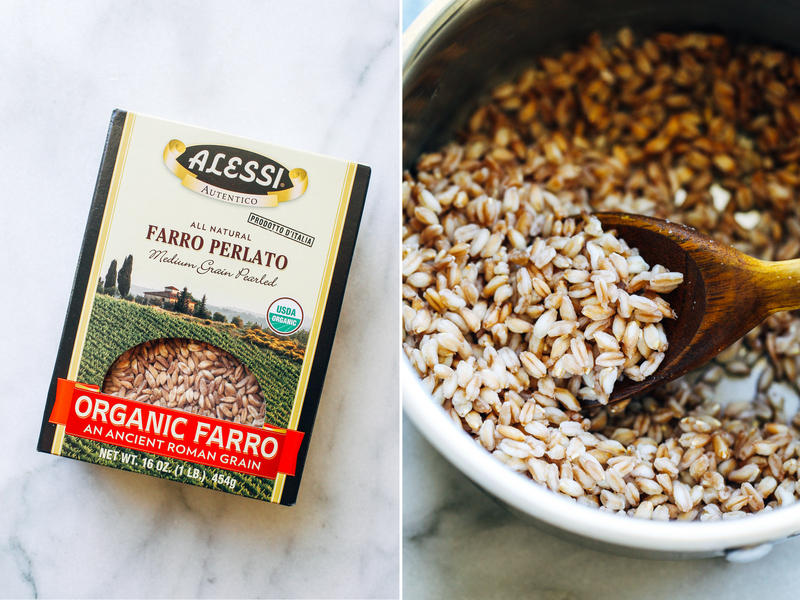 When Alessi asked me to create a recipe using their Farro, it was no brainer. Not only is it organically grown in Sicily but it’s pearled Farro, meaning the hull has been removed which results in a faster cooking time. It only takes 20 minutes to prep. Just enough time to cut the vegetables and whisk together the dressing for this super easy salad. 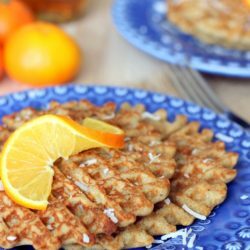 If you don’t have a spiralizer, don’t worry! You can julienne the apples with a peeler or dice them into bite-size pieces. I like to serve this on a bed of kale massaged with a pinch of sea salt and a splash of olive oil to make it more filling. 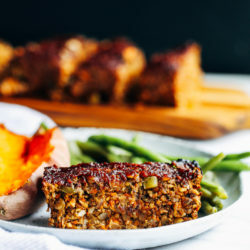 It’s perfect for lunches or a side item at a holiday get together. I hope you enjoy it! In a small pot, combine 1/2 cup farro with 1 cup water. Bring to a boil then reduce to low, cover and simmer for about 20 minutes. Meanwhile prepare the dressing by whisking together the yogurt, lemon juice and salt in a small bowl. In a large bowl, combine the apples, fennel and red onion. Pour half of the dressing on top and toss to combine. When the farro is done cooking, add it to the small bowl (with the remaining dressing) while still warm then stir until evenly coated. Transfer it to the bowl with the apples and fennel then toss together. Serve over a bed of massaged kale or as is and enjoy! 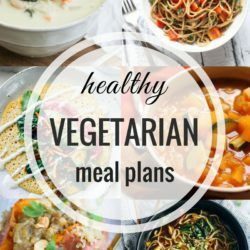 *I used dairy-free almond milk yogurt but any plain yogurt will work. To make this salad more filling, serve on a bed of kale massed with a bit of olive oil and a pinch of salt. 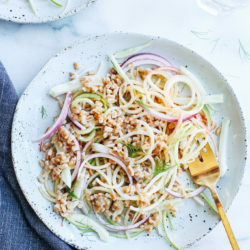 Thank you to Alessi Italian Foods for providing me their delicious organic farro for this recipe and for sponsoring this post! I love fennel! This salad looks awesome. I like how easy it is too! I like the sound of this flavor combination! I dig farro & fennel as well, but for some reason I don’t play around with either enough in my kitchen. This salad was the first time I cooked with farro in a while and I forgot how good it is! 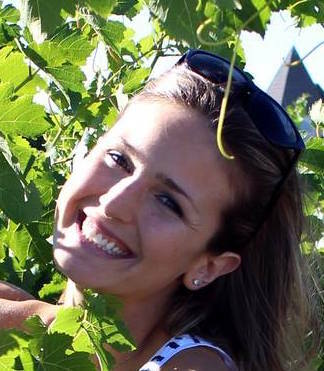 You know I love me some farro! And this salad – it’s so darn pretty! I really need to use fennel more often – I tend to just forget about it! What a delight, Sarah!! 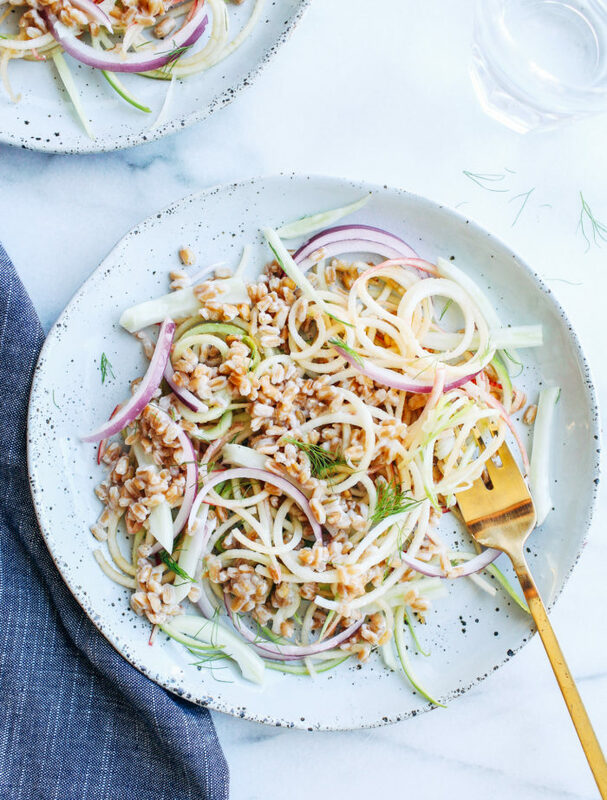 I adore this combination of veggies and apples and Farro is a favorite grain, although I don’t eat it often enough. 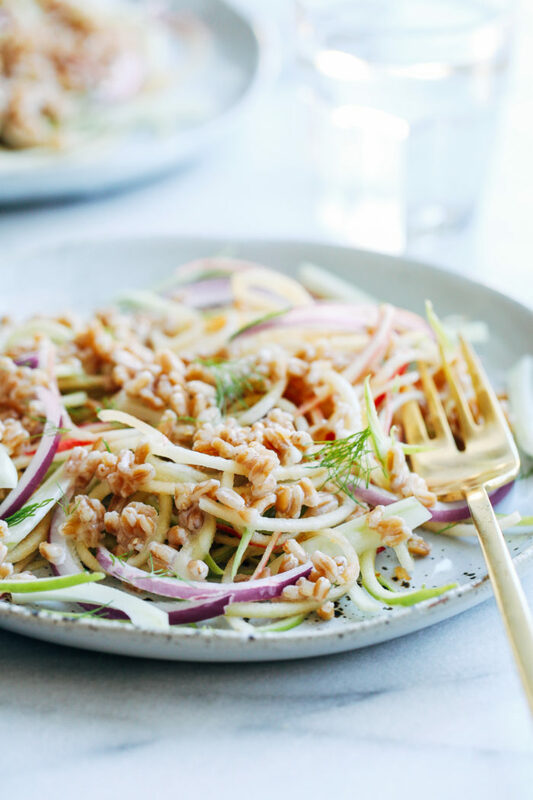 This is such a stunning salad with the oodles of spiralized fennel.. I’ve not thought of spiralizing it! Delicious work my dear!